Foothold is set in the near future, some fifty years from now. It’s a world that is in many ways unsurprising – dystopian, in that climate change is happening as we might predict right now, power is being concentrated into a few large multinational corporations and there are people that behave badly, as some people always will. But it is also optimistic, predicting that in only fifty years we will have settled Mars with self-sustaining colonies, and invented the technology needed to build a starship that can transport eight people all the way to Tau Ceti. The starship Hope is the largest spacecraft ever built by mankind. It has been an international joint venture in much the same way as the International Space Station, this time between the United States, Russia and the European Union. The bulk of the ship’s mass can be found at the front, which consists of three massive spherical fuel tanks, each 100 meters in diameter. These tanks are filled with water, which provides a safe, easy-to-use medium for the ship’s drives to work with. The crew’s quarters are located in the rearmost tank, a location that provides them with the most protection from potential collisions with interstellar debris and radiation. The middle tank is drained first, to maintain that leading emergency impact shield and crew radiation shield for as long as possible. Directly aft of the third tank is the cargo hold, which contains the aerospace shuttle and the four large landers that contain everything the crew need to establish a colony. Continuing our journey to the stern of the ship we next encounter the business end, where the reactor chambers and main drive are located. 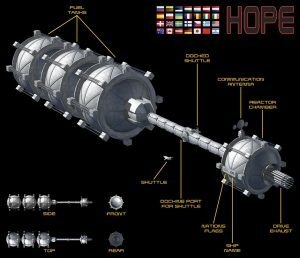 The Hope, despite featuring some sophisticated technology, is still at heart a rocket, the engines generating thrust by accelerating water in the direction opposite to which the ship is to travel. Overall, the ship measures nearly half a kilometer from stem to stern.